10 Important SEO tools of 2018. Why work like fools when you can automate. It hardly matters whether you are related to digital marketing or not. What matters is the perfection & Agility with which you deliver the job. In the age of automation when chat boots have completely replaced humans in one industry, you have to be on your toes to be efficient at least from other coworkers. Trust me ones you start employing these free tools, you will stop working like a fool. From making awesome presentations, designing social media creatives, brochures, to conducting website analysis, competitor analysis and content audit.These awesome tools will not let you feel handicapped anymore. 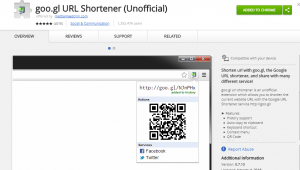 This URL shortener is an extension which is not linked to the Google in any way, hence unofficial. In fact, it is better than Google URL shortener where you have to copy paste the link and put it in the Google URL shortener. Now shortening the URL is a cakewalk with goo.gl URL shortener (unofficial) you just have to click on the extension and copy, Url gets shortened as simple as that. To every digital marketer out there yet to use the analytics, you might be wasting all your resources and assets by employing a flawed strategy and this is where you are missing the trick. Google analytics is a powerful tool which shows the behavior of your marketing strategy from different channels over a period of time. Not only campaigns, find out the number of visitors, bounce rate, session durations on one simple click. With analytics, you can get the real-time audience behavior of your website.Isn’t powerful? Digital marketers often struggle with different tools and most of the times find themselves confused & bombarded with optimization tools on the web. That was a thing of past thanks to Small Tools Seo. This powerful website has allotted different sections for website analysis, content analysis, keyword analysis, image analysis etc. So, If you are searching for all in one SEO tool from rank tracker to sitemap generator, small tools Seo will cover all for you. It will solve the woes of most marketers who are fed up using multiple mediums to remain relevant. A good digital marketer should know how to design an attractive creative for social media posting. Can I create a poster, banner and other social media creative without having to learn Photoshop and other tools, asked my friend? Well, this is what Canva is known for. You can create, edit, post whatever you want and that too without any designing skills. You want to save or copy an important document from a website for future reading but the website doesn’t allow you to proceed. Ever wondered why you faced hardship while saving or copying an importing document or image on the web? In order to protect their data from Plagiarism, some websites make sure copy button doesn’t function on their website. 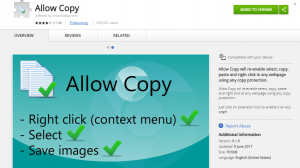 With allow copy extension for chrome, you can simply click on the extension and data gets copied and saved. Do you face problems while writing a grammatically correct blog? Have you faced managers ire for writing content filled with mistakes? If yes, then Grammarly is the solution to end your woes. The web application is crafted in such a way that rectifies all your grammar and spelling mistakes. Upload the document or copy-paste the data into the web application and what you get is a piece of grammatically correct content. AS a digital marketer, you would love to know the secrets behind your competitor’s success. Wouldn’t you? This is what the SemRush exactly does. It reveals the backlinks of your competitors, provide you gap analysis, keywords analysis and all other things that matter to be on page one of search engine research result page. Isn’t it wonderful? Fresh mind and young blood, I entered the digital marketing and used to work hard but still result were not coming until I found a Digital marketing training provider in Dubai who advised me about this amazing ON PAGE Seo tool. Now I don’t have to manually check the titles, Meta description and H1 and alt txt etc. everything is done by Screaming Frog. Managing multiple social media accounts for different clients and keeping eye on them, was always a problem for digital marketers but with buffer that seems to be a thing of past now. 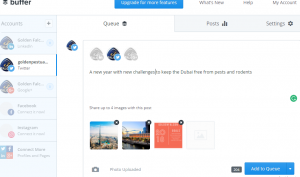 Buffer allows you to connect multiple social media accounts, automate, post & subsequently queue multiple posts all from the one window. Ever wondered why certain websites like Pest Control Dubai top search engine result page and other keep lagging behind despite hundreds of backlinks? Just put the URL of your website into the Moz Open site explorer & you will be shocked to see the results as was the case with me. The Moz Open site Explorer let you know about the domain authority & Page authority of your website and that of a competitor as well. Besides that, it gives you the exact estimate of the number of DO Follow & No Follow backlinks linking your website.